Biomass boiler is defined as a biomass fuelled heating system. It generates heat by burning agriculture & forest residues, burn logs, wood pellets and others. It majorly produces heat by burning wood. Biomass boilers are widely used by hotels, farms, households and others. Further, biomass boiler helps to lower down the greenhouse gas emission due to their low carbon footprints. The global biomass boiler market is expected to grow at a CAGR of 17.9% over the forecast period i.e. 2017-2024. Further, biomass boiler market is anticipated to reach USD 10.8 billion globally by 2024. Moreover, the factors propelling the growth of biomass boiler market include increasing strict governmental regulations coupled with rising awareness about the environmental risks. Furthermore, woody biomass by feedstock type is the biggest feedstock segment in 2016 for heat generation and it is expected to continue its dominance by the end of 2024. In addition to this, biomass stoker by product type accounted for the largest market share in 2016. In terms of geography, Europe is expected to dominate the global biomass boiler market over the forecast period. Additionally, Europe region in 2016 accounted for the highest market share of 36% in the overall biomass boiler market. Europe is anticipated to witness significant growth owing to the strict regulations taken by government regarding greenhouse gas emission. The major countries witnessing the augmented demand for biomass boiler include U.K. and France. Moreover, implementation of government schemes such as renewable heating incentives (RHI) to lower down the use of fossil fuels is also envisioned to bolster the growth of biomass boiler market in this region. Rising usage of biomass such as manure to generate electricity and to produce biomass fuel is believed to foster the growth of biomass boiler market across the globe. 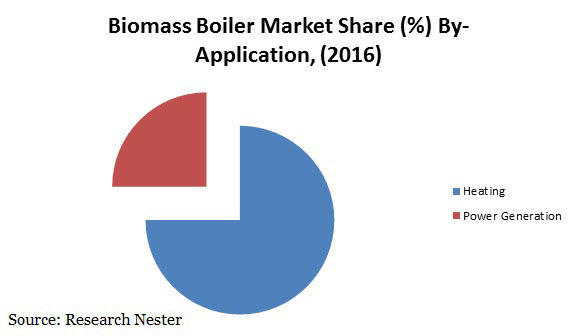 Further, enforcement of boiler standards across the regions is envisioned to bolster the growth of biomass boiler market by the end of 2024. Moreover, rising greenhouse gases emission has led various several agencies such as United Nation (UN) and others organizations to recommended more use of biomass energy sources. This factor is expected to bolster the biomass boiler market in future. Additionally, presence of strict government regulation for the safety of environment and maintaining the ecological balance is also envisioned to foster the growth of biomass boiler market by the end 2024. Adoption of these biomass boilers for waste management and increasing demand for sustainable products are the major factors propelling the growth of biomass boiler market globally. However, lack of awareness regarding biomass boiler and large size compared to ordinary boilers are envisioned to dampen the growth of biomass boiler market.